A ditzy young woman named Fuu is working in a teahouse when she is accosted by a band of rowdy samurai. A mysterious, self-taught swordsman named Mugen enters the shop and offers to disperse the troublesome samurai in exchange for some food, but ends up instigating an all-out brawl instead (this turns out to be a fairly typical pattern for the well-intentioned by frequently dim-witted Mugen). Jin, a young ronin (masterless samurai) enters the tea house in the middle of the fracas. Caught up in the fray he ends up fighting Mugen, with the pair proving evenly matched. So evenly matched, in fact, that during their battle they completely ignore a fire that started during the brawl and end up fainting from smoke inhalation. Upon awaking they discover they’ve been arrested for the murder of Shibui, a magistrate’s son who perished in the blaze, and with the other samurai nowhere to be found Mugin and Jin are held wholly responsible and sentenced to death. Rescue comes in the unlikely guise of Fuu, who upon helping the two swordsmen escape enlists their aid in finding the ‘samurai who smells of sunflowers’, a shadowy, almost mythological figure she believes may be her father. Thus begins their journey across Japan, and a series of incredible adventures that are really best experienced rather than described – some are comedic, some unlikely, others downright frightening. Along the way the back story of each character is explored in detail, numerous battles are fought and the mysteries of the past are slowly revealed. 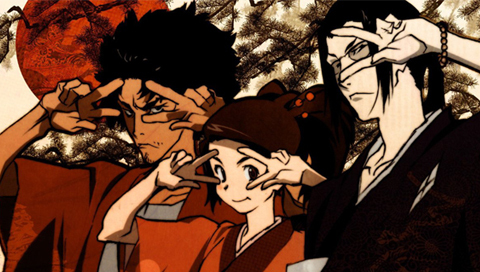 In addition to featuring one of the best anime taglines of all time (‘Death, Betrayal and Hip Hop’) Samurai Champloo also boasts an eminently impressive pedigree, having been directed by Shinichiro Watanabe (Cowboy Bebop) and designed by Kazuto Nakazawa, who created the animation for Tarantino’s Kill Bill Vol 1. The setting and style highlight Watanabe’s typical penchant for anachronism – imbued within the piece’s Edo-period backdrops and traditional costumes are modern cultural references, and the soundtrack is almost entirely comprised of hip hop from the likes of Tsutchie, Fat Jon and Force of Nature. 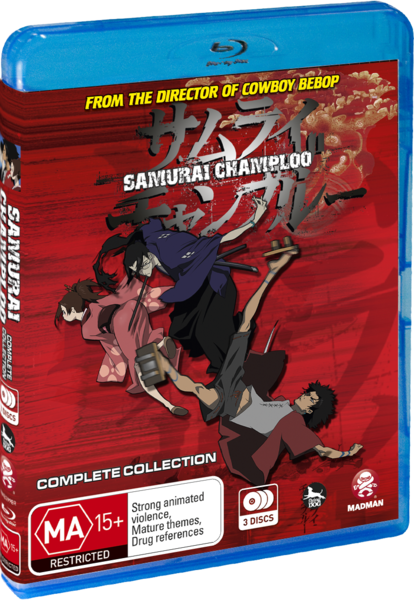 The animation is first rate and the picture quality sublime; Madman’s anime imports always look fantastic in HD, and Champloo might be the best of the bunch. The storyline is also a pleasing mix of drama and comedy and the narrative really holds up for the series full 3-disc, 11-hour run, also something of a rarity in the anime genre. It’s a quality release of one of the most vibrant and unique animated shows of the past decade, and one dedicated anime fans won’t want to miss.